After being a three letter man and Auburn's "Outstanding Athlete of the Year" in 1932, and after compiling a 95-77 record as Auburn's head basketball coach between 1934 and 1946, Shug Jordan spent a year as a professional coach for the Miami Seahawks (later Baltimore Colts) and four years apprenticing under Georgia's own legend, Wally Butts. He had set the stage for himself, and when Auburn suffered a winless 1950, he was called to the rescue by a desperate ambush of Tiger alumni. It was the best move they ever made. After adding five games to the victory column in his first year, and regressing to 2 and 8 in the next, Shug's boys then went to three straight Gator Bowls, beat Alabama five straight years, and by 1957 were the National Champions. In the toughest conference in the land, Jordan was named Coach of the Year four times, and wound up with a 176-83-6 record and twelve bowl appearances. In 1973 he became the first active coach to see his name on a stadium, when Cliff Hare Stadium was renamed Jordan-Hare in his honor. 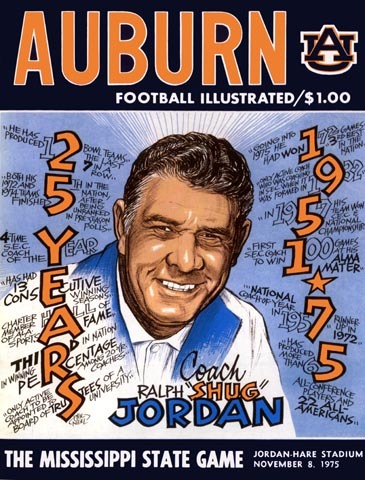 1975 was his final season, and it was only fitting that in Phil Neel's final home cover of the year, he should mark the occasion with this splendid portrait of a true Auburn legend.